Excuse Me, Is CIA Calling Us Terrorists? It is ironic that the United States considers ISI among US-designated 36 terrorist groups. Though the blame also lies with us for working so closely with the United States, which merely uses and abuses us, I’d just like to point out how the CIA is amongst organizations that have no right, in any sense, to call anyone a terrorist organization. Might they be reminded of how CIA ordered the bombing of North Vietnam, use of napalm jelly and Agent Orange in South Vietnamese villages? What about the murder of 28000 innocent citizens of the Dominican Republic during a CIA operation to remove a socialist government? Such ‘situations’ extended to Cuba, with the Bay of Pigs incident in 1961, Chile, with the coming to power of the brutal Pinochet through a CIA-backed coup and even in Guatemala where nationalist Jacobo Arbenz was killed and removed through a CIA operation, merely to serve US interests. But the biggest thing that makes this American move against ISI ironic is their consistent support for Israel, barring in 1956, when they needed the Suez for their own interests. The United States has literally supported a state engaged in genocide. That is terrorism to a whole new level. Falcon (Shaheen) is a born flier high and above the rest, to dive and strike is its favourite sport. In an era of sophistication and state-of-the-art technology, Indian Air Force (IAF), which enjoyed an edge over its adversary, the Pakistan Air Force (PAF) in numbers as well as hi-tech aircraft is gradually losing its advantage. Shiv Aroor & Durga Nandini, in their Op-Ed in India Today, titled: ‘IAF losing edge over PAF’ admit the bitter fact. Quoting Headlines Today, they present the disturbing proof that is causing sleepless nights to Indian defence planners. The duo state that recent presentation by the defence intelligence establishment paints a morbid picture of how the numbers and capability advantage that the Indian Air Force has always found comfort in is rapidly slipping away. Headlines Today has accessed the recent presentation made to the Ministry of Defence. The document makes singularly ominous projections. The most glaring warning is about combat force ratio. The presentation says that the ratio of 1:1.7 is likely to progressively dip to 1:1.2 by the end of 2012. It describes this as a “historic low”. It also says that the traditional hi-tech advantage is almost equal now with 9.5:11 squadron ratio. These statistic should not have come as a surprise as subsequent PAF commands have been burning the midnight oil to fight embargoes, restrictions, bans and sanctions to keep the teeth of the PAF’s fighting force sharpened and its claws honed and its appetite for the kill whetted. The sanctions and embargoes proved to be a blessing in disguise, since they urged the PAF leadership to rely upon indigenization. With the help of its traditional ally and all weather friend China, PAF jointly produced the JF-17 Thunder, a multi-role fighter aircraft, which made its debut at the Farnborough International Airshow, one of the world’s most prestigious aviation global events. Last year’s PAF exercise Highmark and Army Exercise, Azm-e-Nau III, saw the JF-17 Thunder in action, displaying its multi-role characteristics with precision and accuracy at firepower displays much to the awe of the audience comprising foreign defence attachés, defence personnel, media and parliamentarians. The JF-17 Thunder is a multi-role combat aircraft that has the potential to be the mainstay of any modern air force. The JF-17 was developed primarily to meet the requirements of the PAF for a low cost, medium technology and multi-role combat aircraft as a cost-effective replacement for its ageing mixed fleet of Nanchang A-5, Chengdu F-7P/PG and Dassault Mirage III/V fighters. And also to have export potential to the air forces of other developing countries, as an affordable alternative to hi-tech but expensive Western fighters. The story of PAF’s prowess does not end here; it has invested wisely in the acquisition of Force Multipliers like four IL-78 from Ukraine and early warning systems like Saab 2000 from Sweden and ZDK-03 from China, which have enabled the PAF to achieve a quantum jump in reducing the gap with India over technology and firepower. The IAF’s UAV advantage is also diminishing rapidly, as Pakistan is acquiring 25 European UAVs, with more in the pipeline and coproduction of the Italian Falco at Pakistan Aeronautical Complex Kamra. A major setback to the IAF has been the despondent performance of its Defence Research and Development Organization (DRDO), which was responsible for the development of its Light Combat Aircraft (LCA) Tejas. Already fifteen years behind schedule, the LCA is obsolete even before its induction due to the incompetence of DRDO, which Indian media sarcastically refers to as Dodo. Sleaze, graft, corruption and kickbacks have also taken a toll of Indian defence planning and its dilly dallying regarding the choice of weapon systems have delayed the selection of appropriate platforms for the IAF. This factor has not only allowed the PAF to catch up with IAF, but given its superior training and better maintenance capabilities; it has provided the PAF the necessary edge in achieving the cutting edge of technology and readiness. 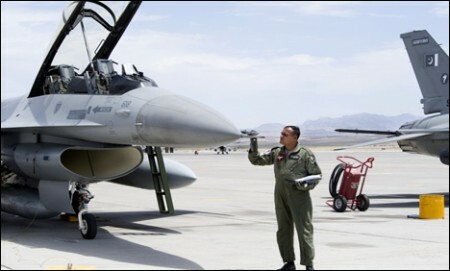 IAF participated in the prestigious Red Flag exercise at Nellis Air Force Base, Nevada USA. Colonel Terence Fornoff, a renowned F-15 pilot, in a debrief of the exercise was highly critical of the performance of the IAF Su-30 MKIs and their pilots, stating that the IAF received a licking in 1v1 and how the F-15 defeated the Su-30 MKI’s vectored thrust. The video clip of the debrief is available HERE. Crumbling unity among militants could provide the Pakistan army an opening to conduct a limited offensive against a particularly vicious Taliban group in a strategic tribal region, according to analysts and a senior military official. The target of such an operation in North Waziristan would be the most violent factions within the so-called Pakistani Taliban. Their leader, Hakimullah Mehsud, is believed to be increasingly isolated after executing a prominent former Pakistani official over the objections of senior militant leaders. Although Mehsud has been linked to attacks in neighboring Afghanistan, his main focus appears to be in plotting carnage elsewhere in Pakistan. And that makes him a prime target for the army. Washington has long urged the Pakistanis to launch an operation in North Waziristan, a region overrun by an assortment of militant groups including al-Qaida. Most U.S. drone strikes in Pakistan take place in North Waziristan. Already there are more than 30,000 soldiers in North Waziristan, and some analysts say the Pakistani army could quickly redeploy to the area. The army has 140,000 soldiers in the tribal regions that border Afghanistan. The Pakistanis, however, are unlikely to target the Haqqani group, which the U.S. considers its greatest enemy in Afghanistan. U.S. Adm. Mike Mullen, chairman of the Joint Chiefs of Staff, complained last week that Pakistan’s secret service maintains links to the Haqqani network. The Haqqanis are Afghan Taliban who control parts of eastern Afghanistan and have bases in North Waziristan. If the Haqqanis and other militant groups in North Waziristan cooperate with a military assault against the Pakistani Taliban, that would give the army more options. The fissures among the militants were laid bare in February, when Mehsud released a gruesome video that confirmed the shooting death of former Pakistani spy Sultan Amir Tarar, better known as Col. Imam, according to a senior Pakistan army officer who spoke on condition of anonymity because of the sensitivity of the subject. As Pakistan’s consul general in Afghanistan’s Kandahar province during the Taliban’s rule, Imam was the conduit for money and weapons to the religious movement. A former Pakistani intelligence officer, Imam met regularly with Afghan Taliban’s reclusive leader, Mullah Mohammed Omar. Imam was known to have kept contact with leading Taliban in hiding in Pakistan since the U.S.-led coalition ousted them from power in Afghanistan in 2001. Taliban members who spoke to The Associated Press on condition of anonymity because they feared being arrested said Mullah Omar made a personal plea for Imam’s life. Also requesting that Imam’s life be spared was Sirajuddin Haqqani, a key leader of the Haqqani group. The senior military official said Mehsud defied Mullah Omar and Sirajuddin Haqqani and went ahead with the execution after the government and army refused his demands to free several of his imprisoned men. Not only that, Mehsud boasted on a jihadi website about the killing, according to the SITE Intelligence Group. The same website carried an Urdu language condemnation of Mehsud’s organization, calling those behind the execution “beasts” and “ignoble killers,” SITE said. The divisions that Imam’s death revealed among the militant groups could provide an opportunity for the army to hit hard at insurgents in the North Waziristan town of Mir Ali, where Mehsud set up bases after fleeing last year’s military assault on his headquarters in neighboring South Waziristan, according to Mahmood Shah, a retired army brigadier and former security point-man for the government in the tribal regions. Mir Ali is about 20 miles (32 kilometers) from the town of Miram Shah, where the Haqqanis are based. Tribal elders from North Waziristan, all of whom were too afraid to talk on the record, fearing retribution from militants, said the landscape in their home region has undergone massive upheavals since the army operation in South Waziristan. They said Mehsud and his men were among the most troublesome of the militants, largely because of their affiliation with criminal gangs. Mehsud and his followers are also among the richest, having accumulated wealth through kidnappings for ransom, thefts and extortion, said a tribal elder from Shawal district of North Waziristan. Mehsud’s close affiliation with Lashkar-e-Janghvi, a Punjabi-based Sunni Muslim militant group blamed for dozens of attacks against minority Shiite Muslims, has also provided him with a reservoir of suicide bombers. They have carried out dozens of attacks throughout Pakistan and in Afghanistan. U.S. officials who did not want to be identified because of the sensitivity of the subject said the Jordanian suicide bomber who killed six CIA operatives in Afghanistan’s Khost province in December 2009 was trained by Lashkar-e-Janghvi’s Qari Hussain, who was also a member of Mehsud’s group. Hussain was killed in a drone attack but was quickly replaced by a cousin and fellow tribesman of Mehsud’s. Mehsud has overseen the Pakistani Taliban ever since his predecessor, Baitullah Mehsud, was killed in a CIA missile strike on Aug. 5, 2009. Hakimullah Mehsud is affiliated with the Taliban’s most violent factions and has survived U.S. and Pakistani attempts on his life. In recent years the United States has identified Mir Ali as the site of a reconstituted al-Qaida. Also on the run in Mir Ali is Ilyas Kashmiri, a confidante of Mehsud’s. The United States this month put a $5 million bounty on Kashmiri’s head. 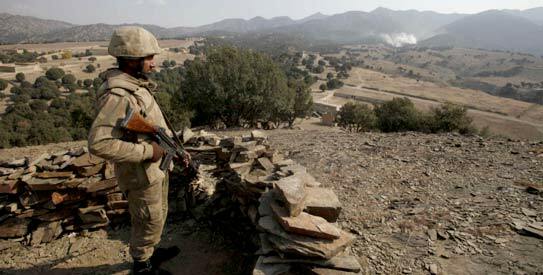 Two Pakistani personnel were wounded when Afghan and Nato forces attacked the Pakistani border check post in South Waziristan’s Angoor Adda area on Wednesday, DawnNews reported. Pakistani security forces retaliated the attack on the Pak-Afghan border and three Afghan soldiers were killed as a result. Exchange of fire at the site of the clash was ongoing between Pakistani and Afghan forces. However, no official statement confirming the incident was issued by the government. Moreover, an AP report quoted officials as saying that Afghan and Pakistan forces traded artillery fire in two places along the border. In one incident, a Pakistani official said two soldiers were wounded on Wednesday in the Angoor Adda. Villager Ahmadullah Wazir said several shops were damaged. Separately, Pakistani officials and Afghan military official Abdul Rahman said that border guards exchanged fire in North Waziristan late on Tuesday. No injuries were reported. The incidents appear unrelated. The Pakistani officials spoke on condition of anonymity because they were not authorised to talk to the media. Afghan and Pakistan forces occasionally trade fire but the incidents rarely escalate or have diplomatic consequences. US media launches a campaign to harass and stigmatize legitimate Pakistani civilian nuclear projects. No word on how US government allowed named Indian defense-related companies to be eligible to trade in militarized nuclear technology. US duplicity on the nuclear issue vis a vis Pakistan and India continues to reveal that the US is not interested in nuclear disarmament or even nuclear arms control. Instead, it is seeking only to target Muslim states like Pakistan from developing even their civilian nuclear programmes through restrictions on exports of dual-use technology even where it is needed purely for civilian use – especially in the case of Pakistan since Pakistan’s missile and nuclear weapons programme is not premised on US designs nor dependent on nuts and bolts from the US. The US media has been playing up cases of individuals caught under suspicion of seeking to export suspected dual-use components to Pakistan and trying to use this to target Pakistan’s nuclear establishment despite knowing full well the total asymmetry between US weapons’ designs and Pakistan’s nuclear weapons/missile development. 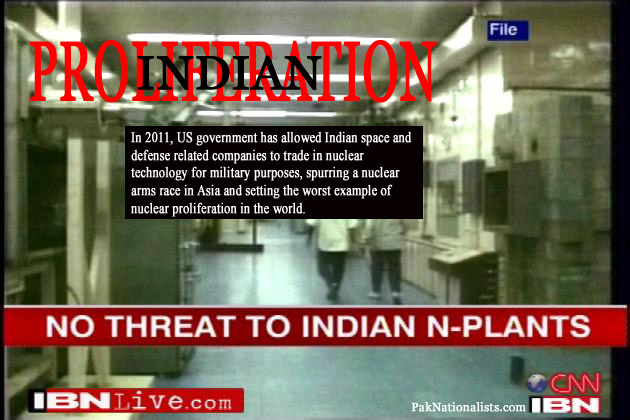 Yet no one has taken note of the fact that the US government has contravened its obligations under the Non Proliferation Treaty (Articles I and III) by removing Indian space and defence related companies companies, involved in the military and nuclear field, from its “Entity List” earlier this year. This action was taken by the US Department of Commerce’s Bureau of Industry and Security which controls exports and re-exports of dual-use commodities, technology and software. In this list of US military gifts to India were nine Indian space and defence related companies including those from the Indian Space Research Organisation (ISRO) and Defence Research and Development Organisation (DRDO). The entities removed from the Entity List are: Bharat Dynamics Ltd (BDL), the four remaining subordinates of the Defence Research and Development Organization (DRDO): Armament Research and Development Establishment (ARDE), Defence Research and Development Lab (DRDL), Missile Research and Development Complex; Solid State Physics Laboratory; and the four remaining subordinates of the Indian Space Research Organization (ISRO): Liquid Propulsion Systems Centre, Solid Propellant Space Booster Plant (SPROB), Sriharikota Space Centre (SHAR), and Vikram Sarabhai Space Centre (VSSC). It is worth recalling that India is a partner in the US Missile Defense program, which has a space-based component. This is just part of Obama’s commitment to moving India into the realm of a de jure nuclear weapon power and bolstering its nuclear capability. All this is being done despite the well-documented Indian proliferation record by US think tanks. It is also yet another example of Obama’s contradictory nuclear policy which is helping to up the level of nuclear armed race in Asia. A few commentators in the Pakistani media are going against the national consensus and are supporting United States’ war in Pakistan and the murder of innocent Pakistanis. Pakistan has suffered, and continues to suffer, unimaginable human, economic, and social consequences of the US-led war on terror. Yet, some so-called opinion-makers with their convoluted views go against the national consensus that the sooner we distance ourselves from this war, the brighter our chances of national survival. Mr. Sethi’s article is, by far, the most misleading and inaccurate analysis of our present mess. At a time when the West is making concerted efforts to disengage from its ten-year war by engaging in political negotiations with its enemy, Mr. Sethi’s recipe for eliminating terrorism conveniently ignores that a failed policy by all accounts cannot be justified as the rationale for more of the same, with some minor “tactical” adjustments. Rather than contemplate, assess and objectively analyze the root causes and the cost of this deadly war and think of ways to mobilise national resources to save the country from further chaos, Mr. Sethi continues to advocate national suicide. The US occupation of Afghanistan was to eliminate Al-Qaeda and the small band of Arabs who had been inducted into the war against the Soviet invasion of Afghanistan. According to Pentagon estimates, there remain around 100 Al-Qaeda members in Afghanistan. The US spends about $100 billion per annum to support the occupation of Afghanistan. So the US taxpayer is being charged almost $1 billion per annum per Al-Qaeda member in Afghanistan. During the Vietnam War, the propagandists tried to persuade the world that the war was justified, and that defeat would produce a domino effect, with nation after nation crumbling before a communist onslaught. At that time also, thanks to our self-serving rulers and their propagandists, we were a frontline state against communism. The US exit from Vietnam resulted in the fast growth of the country’s economy. Vietnamese are enjoying the fruits of peace today. Not a single Pakistani was involved in the 9/11 attacks on the Twin Towers and the Pentagon building. Yet Pakistan is battered and ruined as a consequence of that event. Let us analyse the state of affairs in Pakistan since 9/11, with the focus on Fata. Suicide attacks, an alien phenomenon until 9/11, are almost a daily occurrence there. All the seven agencies of Fata and the adjoining six frontier regions have become ungovernable. Hundreds of schools and health facilities have been destroyed, and the social infrastructure in Fata and Khyber-Pakhtunkhwa is in tatters. The political administration exists in name only and the army is directly administering Fata and Swat. The system of Maliks has been destroyed with the extermination of dozens of noted Maliks in Fata. In all, almost four million people were displaced at one time or another and about one million citizens continue to languish in IDP camps. Our total internal and external debt has ballooned from Rs5 trillion to Rs10 trillion despite US aid. Military operations are a daily occurrence with 140,000 troops deployed in Fata alone, apart from the 20,000 troops now required to be permanently stationed in Swat. Out of the total budget of Rs1.6 trillion, Rs750 billion is being spent on debt servicing and Rs550 billion on defence, which leaves little for social development. Tourism has collapsed and expatriate staff of diplomatic and international development agencies is lured with special hardship benefits, to be posted in any part of Pakistan for the limited term of one year. All the major cities of Pakistan, cantonments in particular, have been turned into fortresses with civilians forced to endure police barricades. An estimated 3,000 people have been killed in 235 drone attacks since 2004, a majority of them innocent Pakistanis. Even the UN has declared the butchery by drones as extrajudicial killings. Hundreds of Raymond Davis-type operatives are on the loose and probably thousands of their local operatives are pursuing agendas totally against our national interests. No wonder, our internal security stands compromised and attempts are being made to rein in CIA operatives roaming the streets of Pakistan. Mr. Sethi’s describes the use of drone attacks as part of the national “solution” strategy and terms the dislocation of the populace in the hundreds of thousands as “problematic”. Can Mr. Sethi even conceive of his own house being leveled, with all his loved ones inside, by a Hellfire missile that was actually targeting another house in the neighborhood? And, as a consequence, his entire neighborhood had to vacate their homes and live in IDP shelters? The policy advocated by Mr. Sethi is only going to lead to further violence and mayhem in Pakistan. Most independent analysts are now convinced that the US occupation of Afghanistan fuels extremism in Pakistan, and if the US wants to help Pakistan, it should leave Afghanistan. What is strategic for Pakistan? For it to be at peace with itself, as a country where, despite the social challenges and poverty, its people can sleep peacefully; where parents can send their children to school without fear; where there are no traffic jams because of police roadblocks; where politicians can reach out to the people without fear of being blown apart; where the images of shredded human bodies are a thing of the past; where international sporting events are frequently held once again, where cultural events can be held without body frisks at security gates. In short, Pakistan should no longer be chasing Al-Qaeda’s ghosts in Waziristan at the behest of the US. As against 3,000 innocent US citizens killed on 9/11, 52,000 innocent Pakistanis have lost their lives and over 100,000 have been injured. If the US policy which Mr Sethi advocates is to protect US citizens from perceived and potential threats, do we have a similar policy to protect our citizens? Or do we continue to allow our soldiers and innocent civilians to be turned into cannon-fodder in pursuit of the policies of self-serving rulers and prejudiced opinion-makers? The above verses of Bulleh Shah, the Punjabi saint Sufi poet, illustrate how the intrinsic substance of nature implicit in its conception cannot be altered no matter what we do. There is a quality of permanence in the essence, essentialness and gist in the constitution and character of every creation. This basic disposition and temperament in its lifecycle cannot be altered. Nature simply does not allow it. The offspring of crows can never turn out to be like swans. That is how nature works. Bulleh Shah’s reminder that bitter water wells cannot be turned into sweet wells is not only an element of passionate poetic assertion to human emotions; in fact, it is an impassionate appeal to human reason based on a matter of fact objectivity observed in nature’s organic and genetic systemic processes. What goes for all other elements in this universe’s existence is also true of human nature. The majority of people do not change much in their entire lifetime and the possibility of a complete turnaround in anyone’s behavior is remote. My conceptual point here is that, metaphorically speaking, Bulleh Shah’s above-quoted verses perfectly apply to Pakistan’s contemporary political culture; the reform from within our present political system and its ailing political leadership is as remote a possibility as a crow becoming a swan. The reasons for this impossibility are quite obvious: Our political leadership presently, and in the last 6 decades, has been so colonial-like, so backward and reactionary, so self-promoting and egocentric, so non-visionary and unimaginative, and solely possessed by a mindset that is a one-dimensional focus on treating politics as a crafty means to seek and hold power – even at the cost of national survival and our future existence as a nation. They are completely blind and insensate to our socio-political realities, they do not understand the concept of social cohesion and a social contract between the governed and the governors as a means to bring all Pakistanis together across the country so that people can resolve all of their problems including economic deprivations, provincial and sectarian issues, the question of terrorism and an end to the so-called war on terror imposed on this nation from the outside. Our ruling elite is incapable of understanding that people of this nation can establish a civil state with the rule of law and can restore peace and prosperity to this nation. On a daily basis, our ruling “Mafia” invokes the threat of terrorism as an attempt to continue to cling to power as if they are the only ones capable of bringing stability and tackling terrorism. It would be foolish for the nation to believe their lies – in fact, the ruling elite themselves have been instrumental in bringing terrorism to this country and in continuing this war on its destructive path. All of this must stop now—before it’s too late and we are doomed to face an uncertain future. What needs to be done to save this nation from imminent ultimate destruction at the hands of its contemporary political leadership? Our only recourse to the resolution of our national problematics and dilemmas now are the midterm elections and constituting an independent Election Commission. This will be the most important factor in the process of the democratization of this nation. Let us be clear as to what a democratic structure entails: Democracy is not the rule of the majority – it is a system in which the majority of people take part in political, social, and economic decision-making. Majority rule and the majority of people taking part in national policy-making processes are two different things. Let me illustrate the point here: Suppose in an election, Candidate A receives 45% of the public votes, B receives 30 % and C and D receive 15% and 10% respectively. Be mindful here now; If candidate A is declared a winner, representing only 45% of the voters, then 55% of the people go unrepresented – and that is entirely contradictory to the principles of representation in a democratic system. Based on the present political system, the well-entrenched political class, from which comes the political leadership of this country, has been exploiting democracy to its own advantage. The feudal lords, the “gaddi-nasheens,” the industrial autocrats, the military-civilian mafia, the ever- turned around “lotahs” have seized upon the political process for far too long. This entire election procedure needs to be altered now. The future Election Commission of Pakistan will have to devise and structure and alternative election process to ensure that the majority opinion is represented at all levels of elections in the country (majority opinion as opposed to simply majority rule). To do this, the EC will have to change the entire set of rules for a candidate to win an election; when a candidate does not acquire an absolute majority (let us say set at 70% of the votes) a second round and a third round of voting will have to be conducted until a candidate is able to inspire confidence in voters who are willing to change their voting loyalties. This will entail hard work, clearly laid-out political platforms, and an extended evaluation and assessment of the candidates’ personalities, their political views, problem-resolution strategies, and above all, a longer period of time for the public to do this close and seriously-focused scrutiny. Indeed, such a democratic election process will be time-consuming and costly. But this is the only method by which the traditional political leadership can be challenged in the public arena, and their six-decade-old monopoly on political and economic power can be eliminated by people’s democratic participation and will. As for the reform of our present political culture from within, it is an illusion to imagine that such a thing can happen. Indeed, it is an absurdity of thoughtless political imagination that internal reform can be accomplished by the political elite that have themselves time and again betrayed this nation’s democratic ideals and aspirations. This nation’s elections have been hijacked before and the present political leadership will continue to steal from this nation, including elections, as long as we, the people, do not stand together to confront them. That is what the Egyptian masses did at Tahrir Square in Cairo last January – at least in its first phase of demonstrating people’s democratic power. Tohray sau mon khund paviyai hu! Pakistan has stopped all US operations from the Shamsi Air Base in Balochistan, an airport which was given to American forces for use after 9/11 and drone attacks were launched from the base on targets in the tribal areas, military sources have confirmed. It was also used extensively in 2001 when thousands of US sorties took off to bomb Afghanistan a few weeks after the 9/11 attack in New York. As the relations between Islamabad and Washington have strained due to latter’s mounting interference and repeated breach of Pakistan’s sovereignty, the US Embassy spokesman, Alberto Rodriguez, confirmed that there are no US forces at the Shamsi Air Base in Balochistan. Pakistan Air Force (PAF) spokesperson, when approached about his version on the vacation of US forces and the deadly drones from Shamsi airfield, explained that the airfield does not belong to the PAF while the Pakistan Army sources confirmed that the airfield was free from the American forces. No one was prepared to share with The News the dates or the time period when the Shamsi airfield was vacated by the Americans although the sources insist that it is a recent development. Almost a year back, Defence Minister Ahmad Mukhtar spoke on the topic of the Shamsi Air Base confirming that it was being used by American forces for logistical purposes but, he added, the government was not satisfied with payments for the use of the facility. Mukhtar, however, did not go into the nature of airfield’s use by the American forces. Prior to Shamsi, Pakistan had also got vacated from the US forces the Jacobabad Air Base and Pasni, which were used for its operations in Afghanistan. The US has been using the Shamsi Air Base in Balochistan province to station unmanned Predator drones that have been used to attack terrorist targets inside Pakistan’s tribal areas. Shamsi airfield, also called Bandari, is a small airfield and air station located about 200 miles southwest of Quetta near the town of Washki. In 2009, media reports revealed that the airfield was used by the United States Central Intelligence Agency as a base for Predator drone attacks on so-called militants in Pakistan’s tribal areas but ended up killing several hundreds innocent people. On January 9, 2002 a US Marine Corps KC-130 aircraft reportedly crashed on approach to Shamsi. All seven crew members were killed in the crash. In February 2009, The Times of London had announced that it had obtained Google images from 2006 which showed Predator aircraft parked outside a hangar at the end of the runway of the Shamsi airfield. Before that, a US Senator Dianne Feinstein said that the CIA was basing its drone aircraft in Pakistan. The US company Blackwater was also reported to have a presence there, hired by the government to arm the drones with missiles. It was General Musharraf who had permitted the US to use its airbases not only to attack Afghanistan but also to launch drone attacks on the people of Pakistan in the name of the so-called war on terror. The present regime also continued with Musharraf’s policies and allowed much larger number of drone attacks than before. WikiLeaks had revealed that Prime Minister Gilani had endorsed the drones’ policy. Gilani was reported to have even said to the US officials that his government would raise hue and cry over these drone attacks for the sake of countering the public pressure. However, of late and after the Raymond Davis episode, things became extremely tense between Washington and Islamabad with the CIA insisting to carry on with its operations, including the drone attacks inside Pakistan, while the ISI is adamant to restricting the Americans from crossing the red-line. 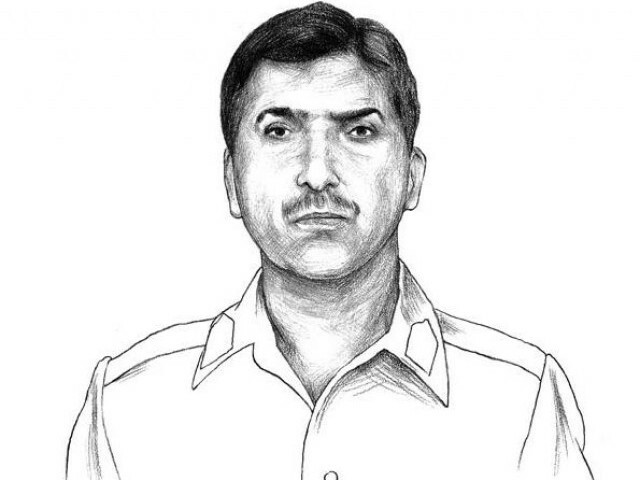 ISI Chief Ahmed Shuja Pasha has made it on the ’2011 Time 100 list’. The list includes the names of 100 most influential people of 2011. The list was released Thursday on the magazine’s website. Former CIA director Michael Hayden in the list has written about Pasha and said that the Lt General is a “Pakistani Patriot” and an American partner. Within weeks of Lieut. General Ahmed Shuja Pasha’s becoming head of Pakistan’s top intelligence agency, ISI, in 2008, terrorist attacks in Mumbai seriously roiled already stressed U.S.-Pakistani relations. Pasha, 59, has grown progressively more suspicious of U.S. motives and staying power. The arrest of a U.S. government contractor in Lahore has led to acrimony. And larger changes in Pakistan — the growth of fundamentalism, nationalism and anti-Americanism — have squeezed the space in which any ISI chief can cooperate with the U.S.
Other people who made the list are Justin Bieber, Michelle and Barak Obama, Mark Zuckerberg, Julian Assange, Colin Firth, Joe Biden, Aung San Suu Kyi, Prince William and Kate Middleton, Hillary Clinton, Oprah Winfrey, General David Petraeus, Matt Damon and Gary White, Mark Wahlberg,and Lionel Messi.